I'm aware of two main methods of adding trapunto to hand quilting. Since most of my quilt is already quilted, I've been left with just one option which I'll try to explaining here step by step. This is my first try at it and I'm no expert but I found it relatively easy to do. All the photos can be clicked on for enlargement. I'm using an acrylic bulky yarn that is very soft and doesn't have a tightly twisted ply. You can use wool but it must be washable and preshrunk. Matilda's Own had one for trapunto that they discontinued several months ago. A six inch trapunto needle. I do know that Clover, Bohin, John James and Birch all make them. A shorter tapestry needle can be helpful for small shapes. Small sharp pair of scissors. Rubber finger to help pull the needle through. This yarn is very soft and doesn't feel like nylon at all. I like that the plies can be separated if needed. Double over the yarn and thread the needle through the eye. I'm using doubled yarn so I make the tail ends even. Because the tip of the needle is blunt, it won't damage the threads, it will separate them. A sharp pointed needle would damage the fabric threads and that's not what we want. I'm glad I used a plain muslin fabric on the back, it would be harder to see the quilted shapes otherwise. You can work the stuffing with or without a hoop. I like to do without since I can hide the thread ends easier later. 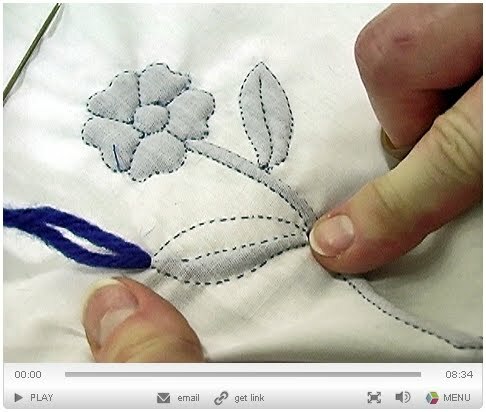 Wiggle the tip of the needle into the shape to be stuffed on the back side of the quilt. In this case, it's a feather shape. I'm holding the quilt sandwich in my left hand like a sock puppet. The needle goes between the fabric and batting, not underneth the batting or in it. The needle exits at the bottom of the teardrop shape. It doesn't seem to matter if I start at the top or bottom of the shape. Pull the needle and yarn through, you'll need to tug a little. I leave about 1/8" tail at the entry hole, sometimes a bit less. I like to put my finger behind the thread at the exit end so that I'll be more in control of cutting the yarn. About an 1/8" is good. I make this cut very deliberate and slow so as not to have an accidental cut into the quilt. I've found that I can cut quite close after a bit of practice. Caution is paramount though. If I stretch the quilt sandwich like so, the thread ends often disappear inside the shape. Another option is to take a sharp needle and insert and twist around the yarn inside to get it to go inside the shape. Or you can use the toothpick to poke the ends in the holes. If you lightly scratch the warp and weft threads around the holes in the direction of the straight of grain, the holes will almost close up. I use the toothpick or a sharp needle. After washing, the threads around the entry and exit holes will close and tighten up further and there will be no evidence of how the stuffing got in there. After doing what I described above, you can hardly see the gaps. Cotinue adding the yarn until the shape is stuffed sufficiently. I'd hate to tell you in what order to stuff the shapes as I've found what suits me depending on the size. You could start in the middle and alternate side to side or you could start at one side and go from one side to the other. You may need to stagger some yarn so that you stuff more plies at the fat end of the shapes. Do that by adding yarn from the fat end to about the middle or two thirds of the way down. You know you've overstuffed if the quilting stitches on the right side look wrinkled. Stuff enough to give a full look but not too tightly that there's no give in the fabric. Check on the right side of the quilt. Here's how it's looking so far. I still have more to do on the bottom left ring. See, it's not hard but it does take time and it can be hard on the hand pulling the yarn through. For cording or stuffing narrow lines, I would assess how many plies it would take and the process is exactly the same. If the channel is narrow, try a smaller tapestry needle. Thanks so Much Janet..I've always wanted to know how this was done but have never had the chance..
very nice Janet well done. That quilt is just gorgeous. I hope you are going to enter it in a show! Excellent tute, Janet. Now I know how it's done! Very labor intensive but oh sooooo worth it! Thanks for taking the time to do this. Much appreciated! Coming along nicely. Your quilt looks wonderful. The rolls or squares of 'bubbily' rubber that is used in kitchen drawers to stop dishes sliding makes a wonderful gripper for pulling a needle through. Just cut a small square to use.Available in our Supermarkets beside the kitchen utensils. Thank you for explaining how you did it Janet. I had a workshop with Sandie Lush and she showed us how to do trapunto style quilting but we stuffed from the front exactly as you showed. I even managed to snip a small hole just as you warned about and had to do a nifty bit of applique to cover it up. What a difference it has made to your quilt though. It looks sensational. I think everyone will agree. It doesn't matter then if the wool is under the batting, between the bat and the backing? It looks quite puffy on the front as well as the back, is that so? Thanks so much for sharing this with us. I've never seen this done. If I understand correctly - you don't have to deal with sealing up the entry and exit "wounds" either, ha? (wounds? hee). What patience you have! The end result is absolutely beautiful. Thanks Janet, I love the look of it. one question, do you just pass one piece of yarn? what if its a larger area, how do you stuff more in, by repeating? Lovely work - great tutorial! Thank´s for this Post. I´m very interested for trapunto. I hope to learn it, in the next Time, on a little projekt. Thank you Janet, wow it has brought the quilt to life. Thank you Janet! Lovely work and your tutorial is splendid! Absolutely stunning! Your tutorial is spot on perfection for those who will want to try their hand at it. As for me....love the look....perhaps not the patience. Thank you so much, Janet. This is a wonderful tutorial. That is one longgggggggg needle! Now I understand how you are doing the trapunto after the quilt is done. Wow! Your quilt looks amazing. The french one reminded me of how it was done in India. I was too young to appreciate all while growing up. My mom used to do shadow work with embroidered organza with contrasting yarn..Those days so long ago.. Thanks for sharing the tutorial.. I will try it some day. Very well presented! The process does not look so scary now...and the results are gorgeous. Your Double Wedding Ring will be a quilt for all time. I love the movement you created by gradating the rings too. Exquisite work - like a rare wine, why rush things?? Love how much dimension this gives to your quilting! thanks for the detailed tutorial...may give this a try on a wallhanging first! Your method is exactly what I've learned for doing trapunto after your quilt has been sandwiched and quilted. I have always loved this quilt and enjoyed seeing your progress .... but now .... oh my .... beautiful beyond words! Thank you for the wonderful tutorial Janet!! The only method I had seen was to actually snip the back of the quilt....that isn't ever going to happen here!! LOL. This is an absolutely exquisite quilt and your hand quilting is perfection! The trapunto (by hand!) takes it to another level of gorgeous! Submit this one for show -- oooo's, ahhh's and wow's to you! Wonderful tutorial Janet! I've tried trapunto or "stuffed work" three times. Each a bit different technique..and all different from how you've done it. What an interesting tutorial!! It's really unbelievable how much more your quilting shows now. It's such a gorgeous quilt and you're taking it to a whole new level with the trapunto. I am going to try this for sure. Thanks! Great explanation Janet, and it adds so much to the quilt. Wow Janet. Thanks for the explanation. I've read about Trapunto before, but never had anything on which to try it. It looks time consuming, but easy. Yours is certainly beautiful! It looks amazing! How would you was a quilt with trapunto? wow...that is amazing, thanks so much for the tutorial. Your quilt is wonderful. This technique is so worth it. My 2 cents is that I use a small scissors with curved blades. That way the points of the blades are pointed up, away from the quilt back. I am still very careful; but seems to be safer. Thanks so much for sharing how you did this. I have the perfect little project to try this out on. I can't wait to get started! Wow, Janet, that is fascinating. I just knew you were taking out lots of quilting but your process is really neat. Thanks for sharing. The link is neat too. This is so interesting - thanks so much for the explanation. You are so brave to cut so close to your beautiful quilt! I may try this on a small quilt someday - it is so beautiful! You are a big inspiration, lady! I'm always learning something new here and I love it. I may never do trapunto but it's fun to see how it's done. I never knew. Not only do I learn something new I get to see lots of beautiful things. Thanks Janet! Thank you for sharing how you did this! Fascinating! I had no idea how trapunto is done and love the effect it creates on your quilt. p.s. Your applique flowers are so creative and unique. Fun! Beautifully done. Thank you for sharing how you did you work. I've tired the other way where the prep is done before finishing but not this method. I can find myself referring back to your tutorial. Thanks. Your tuto is very nice!!! Thank you so much for sharing your technique. I'm getting close to starting my first-ever hand quilting project, and seeing your work is so inspiring! And truly, the trapunto you've done is gorgeous. Thanks for the simple to follow instructions. Getting ready to try trapunto for the first time on my newest grandbaby's Christening quilt. All hand quilting is done and want the center medallion to "pop". Just curious: how long did it take you to do this? I have an applique quilt that needs a bit of 'umfph' and I thought this would be good to do. Thanks in advance. I love this type of work but always wonder what happens when the quilt is washed.